Do you own an American flag or your countries patriotic flag? What kind of shape is it in? As I pulled my American Flag out to put up on 9/11, I found it a bit faded, tattered and torn. This would be the last patriotic day for this flag, apparently I was long overdue for a new American flag. As I climbed down my ladder and looked over at some of my neighbors to find their flags were in various stages of aging too. Always thinking about Fundraising, I thought what a great opportunity and product to fundraise with – American Flags or other Patriotic Flags. Many organizations, schools, sports teams, churches, clubs and groups reach out to their family, friends and communities to raise funds. Offering the right product that every household or business could use can certainly make a difference in their fundraising success. Instead of some of the standard products like candy, wrapping paper, magazines, discount coupon books, and cookies why not consider a product that is more useful and nearly every household or business can use a flag. Flags are ideal for fundraising. They’re calorie-free, nonsectarian, won’t pile up un-read, and they come in several sizes to fit everyone’s needs. Further, fundraising opportunities are not limited to just once a year, but rather they can be on-going throughout the year. 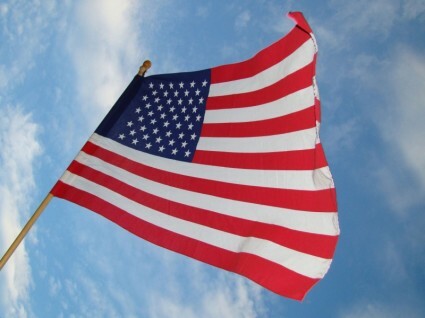 You can sell flags as a one-time sale to put out for holidays or as an ongoing service as well. Offer a 1-year flag posting service. During the year on major national holidays your organization will post flag(s) in each purchaser’s yard in the morning and then remove them before sunset. Having the flags in the yards on these national holidays will generate interest from the other neighbors and should help increase sales each year with a goal to have the whole street lined with flags on holidays. Consequently, your fundraising profits could grow each year as well. During the first service year, you will need to purchase all of the materials. Subsequent years should yield nearly 100% profit on repeat customers because you have already purchased the materials. For example, you could charge $30 – $50 per yearly subscription. The first year you would keep about half the proceeds collected after expenses. However, in the following years you would receive 100% of the proceeds for the same number of subscriptions! There are many days to raise the American flag as well as several days to raise patriotic flags for other countries such as Flag Day, National Day, Republic Day and public holidays. Which makes selling flags a great fundraising opportunity. Below are the official dates that are recognized as days to raise the American Flag, including when you should fly them at half-staff. With several days to celebrate with flags, you may want to consider other types of flags to offer. Parades are a great time to sell hand-held flags. Flagsticks can also be sold to sit on desks or countertops in homes and offices. Car flags and magnets are also popular to show patriotism as well as decals and patches. Assorted sized lawn and yard signs can also prove profitable. Check out the many flag sources on the internet to find the company and products that best fit your goals and needs. Saluting you and your flag raising fundraising efforts! I am the freshman class advisory and looking for fundraising ideas to present to the freshman class officers. Can I please get more information on your fundraising program. Are these full sized flags for homes or hand held sizes? How much does each flag cost and how much do we sell each for. I am the Vice President for the Santiago High School Air Force JROTC Booster club and we are currently looking for fundraising ideas for our cadets.